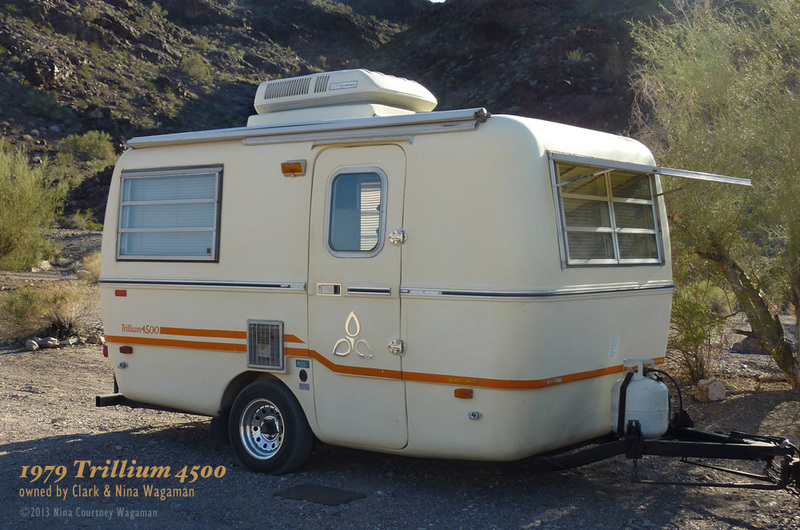 Our Trillium 4500 is almost thirty-four years old. Her first owners bought this beauty from a dealer in Irvine, California, at the end of November 1979, the year she left the factory in Ontario, Canada. 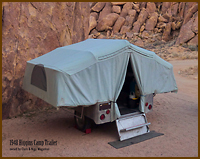 We learned that they enjoyed traveling with other couples who also owned small fiberglass trailers. This pair must have taken very good care of her, because she shows little wear. How she eventually came to reside in Arizona we cannot tell. She was passed onto us by Lloyd and Judy, having languished unused under a carport there for nearly six years. We now have the privilege of continuing her good care, but we plan on taking her places! As soon as we got Miss Trilly to California, we began cleaning and taking stock of what needed to be done. Clark and I decided that we wanted to replace the seventies-style gold/brown/white heavily textured upholstery, even though it was in amazing condition, split in only a few places. I began looking for fabrics while Clark started cleaning Miss Trilly‘s gelcoat. He used 3M Fiberglass Rubbing Compound first, then moved up to 3M Finesse-it Polish. We discovered a wonderfully detailed explanation of how to restore gelcoat written by Jamil Mehdi at Fiberglassics.com. Clark found his recommended Collinite wax worked easily. Miss Trilly is looking very smart in her shiny new coat. I cleaned the interior and removed the indoor/outdoor carpet. Removing the old, dried-up carpet tape that had been used underneath was quite a chore. The tape did not stick well to the back of the carpet, but it held tenaciously to the gelcoat of the floor. I went through three-quarters of an 8-ounce bottle of Goo Gone! My fingernails proved to be the best scrapers. We are not sure what kind of material we will put down as floor covering, but we are certain that, whatever it is, it will not be adhered to the floor in any way! We know also that we want to keep it lightweight, removable and cleanable. 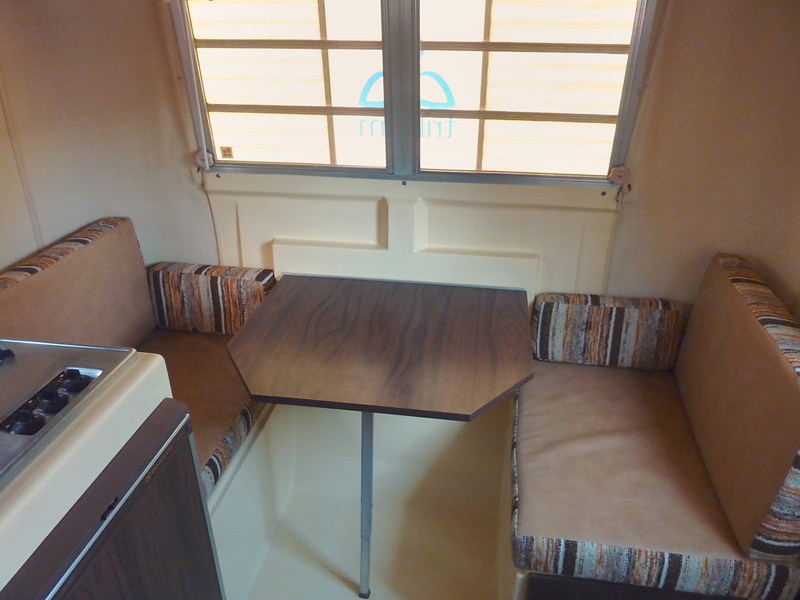 Front Dinette with vinyl side of the cushions on top, mini-blinds pulled up. The exterior fiberglass rock shield/window awning is filtering the light. 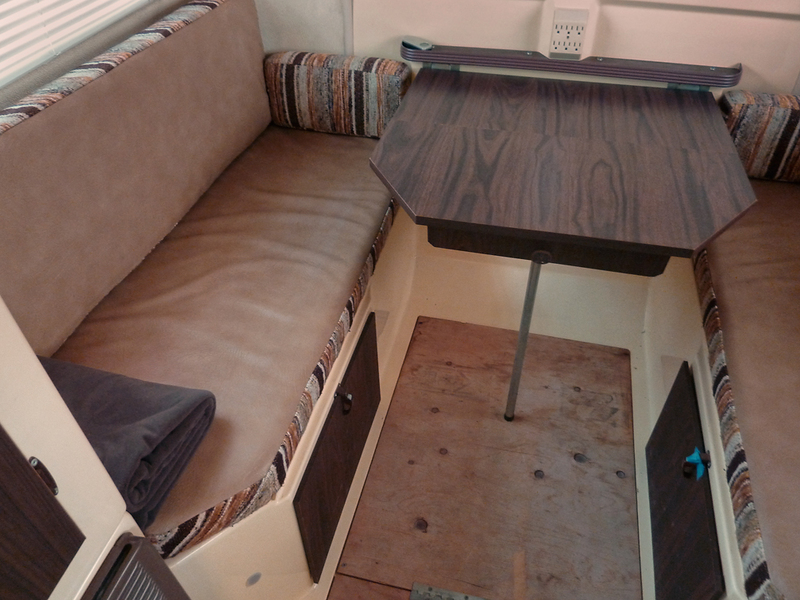 The aft table has a leaf extension and this allows the settee to make up into a nearly double bed, 52 by 75 inches. We will likely be leaving the new mattress (not shown) in place for sleeping and lounging. There is lots of storage under the seats! 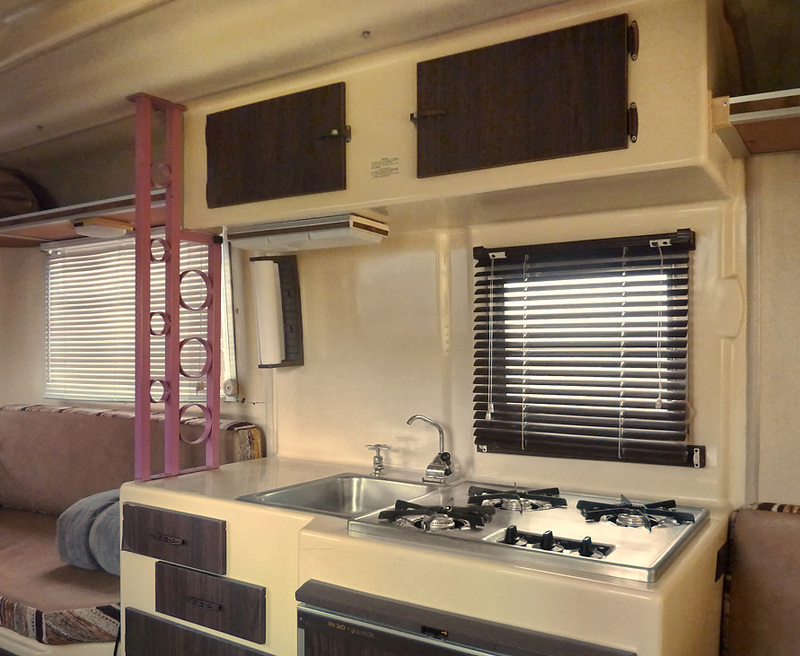 The galley is equipped with a 3-burner propane cooktop, a 3-way refrigerator, and small sink with water hand-pumped from the onboard tank or pressure water from an outside hookup. The drawer is offset to allow for the back of the power converter. The pink ironwork was added at some point in Miss Trilly‘s life. Trillium never had such supports in their trailers. 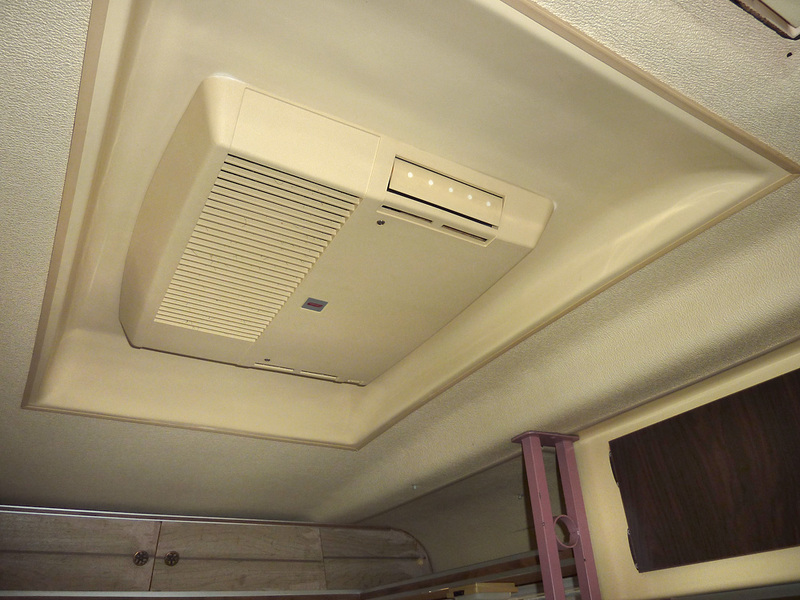 Our 4500 also has factory-installed air conditioning. There is a saddle over the roof that is designed to handle the added weight of the Mini-Mach and an indentation in the ceiling so the interior components do not encroach on headroom. We think the support was added as insurance by a former owner. We are considering its removal, along with replacing the AC with a solar panel. 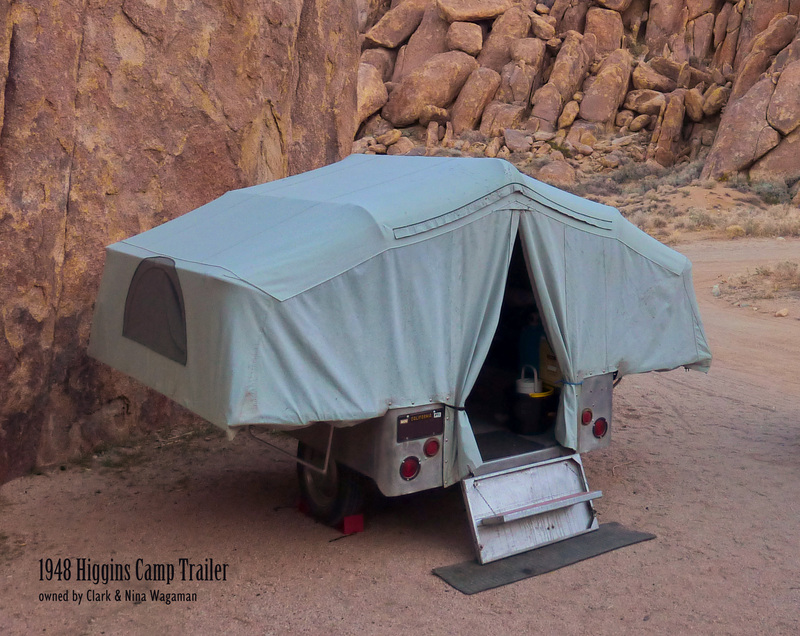 We like to dry-camp in the Fall and Winter months. A heater and 12 volt power are much more desirable. The ceiling installation of the factory AC unit is thoughtfully designed and attractive. This is where we are now, January 28. The fabrics are on order for the cushions, which I will be making up myself. The foam is in very good shape and I plan on giving it a Dacron wrap. We took down the mini-blinds. I will be making roll-up shades that function similarly to those I made for our boat. We think the beige IKEA Anno Sanela panels will work very well with our color scheme, which is muted and modern. In the next two months, Miss Trilly will be undergoing further transformation. She will be getting a new axle with a bit higher ground clearance. Tom Young of TrilliumRV.com gave us the specifications he uses on the Dexter axles installed on the new generation of Trillium trailers. Tom ran the Ontario factory for ten years, so he knows Trillium inside out. Though Trillium in Canada ceased production in 1983, Tom has begun building this great little egg trailer again, this time in Florence, Arizona. In our opinion, Trilliums are the best trailer on the market. The vintage units are still sought after and we feel very fortunate to have found Miss Trilly! Love the trailer. Trillium trailers have been made again for a while now out of Calgary. A great resource if you need any parts. Can’t wait to see what it looks like when your done. Looks like you’ve quite a project going with the Boler! We visited Tom Young at the Trillium RV factory while we were in Florence, Arizona, picking up Miss Trilly. Tom worked for ten years building Trilliums at the Ontario factory. The gent in Calgary is using the same Trillium molds, but has made some changes, we understand, to the interior and frame of his Out Back trailers. We really like your photos of snowflakes. Even though they weren’t sharp, the crystalline detail was very evident. Hope we can keep up posting as often as do you… We will be going back to BC on our boat for six months, beginning in April. Miss Trilly and Higgins will be in storage. We wish you well with your “egg”!